We landed in Buenos Aires after dark. The cab sped north towards the city centre, the cluster of lights that an hour earlier we’d craned our necks to squint at from the air, now rushing upon us. First, along the freeway, the street lamps and billboards, then a car park and an apartment block, it’s lit windows vibrant rectangles against a column of black. Then come the residential streets, cafes, bars, shops and supermarkets. Through net curtains a television flickers while its three viewers chat animatedly over its noise. Fairy lights hang over the door of a bar outside which a girl with a camera is ordering her friends into a line. Through the darkened windows of the closed shops we make out the silhouettes of chairs, bed linen, power tools, shoes, lamps, mannequins. A glimpse through the window of a restaurant, or bar, or kitchen, or bedroom shows glasses half full, forks mid-air, anecdotes mid-flow, confessions about to be heard and apologies just made, tears being fought back, laughter on the verge of brimming over. The city flies by in a sequence of light and dark, seen and unseen. Like frames from a movie, each scene appears frozen in time. I love arriving in a city at night. Those snatched moments, lives lit for a fraction of a second before they disappear from my view, seem to be brimming with promise. By day a city seems ordinary, however vibrant and chaotic. Business is carried out, transactions are made, conversations and arguments are had, and the cogs of life, of industry, of society, turn. But at night the ordinary evaporates in a gentle hum. Then, when the buildings sleep and the world exists in chiaroscuro, that’s when inspiration flickers into life, when hope hangs in the air and anything seems possible. A new day approaches. What will tomorrow hold? 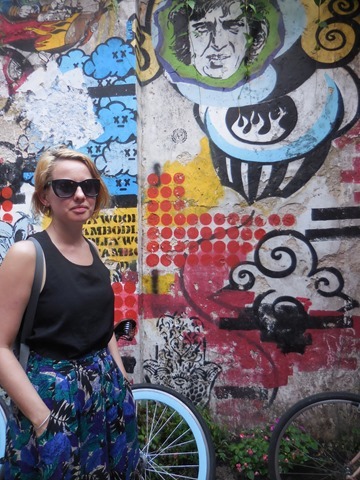 I loved Buenos Aires before I even saw it. Described repetitively and unimaginatively as the Paris of South America, it seemed inevitable. 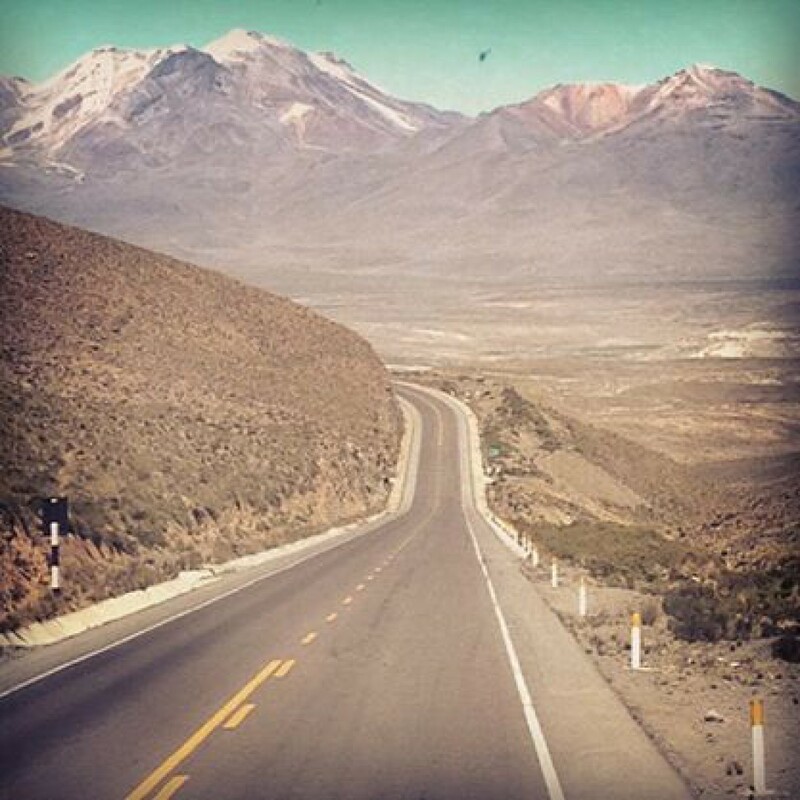 A European-syle city in the heart of Latinoamérica, accessible yet alien, I knew that on a straighforward level, I could feel comfortable there. But Buenos Aires is not Europe and it is most definitely not Paris. 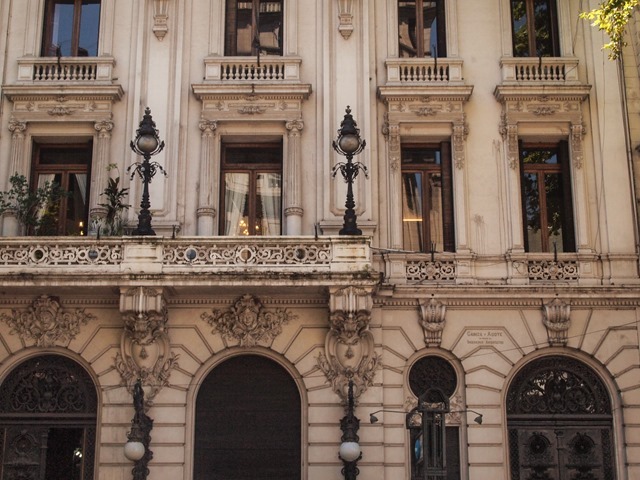 The grand architecture, the boulevards and plazas, the wine bars and coffee shops are reminiscent but deceptive for beneath it all burns a spirit and identity that is entirely Argentinian. 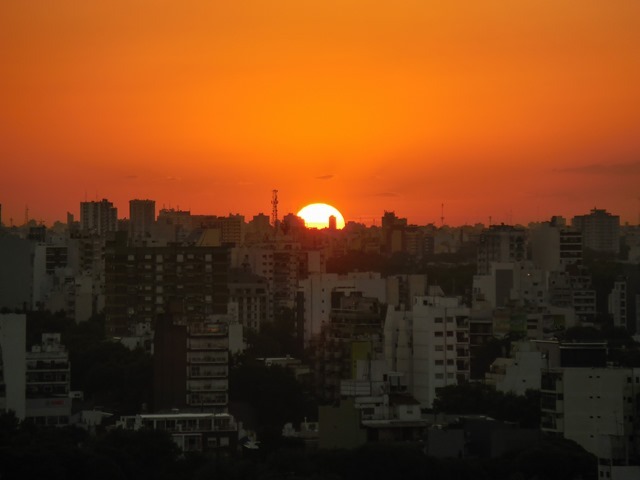 Not only is Buenos Aires unlike any European city I have visited, it is unlike any South American city I have visited. Its history is familiar enough: colonisation, international trade, the growing of power and the subsequent attempts to consolidate this power, attacks from the British and French, independence from Spain, unification, immigration on a grand scale, art, literature, theatre, music and vast economic growth. And all this before the start of the 20th century. 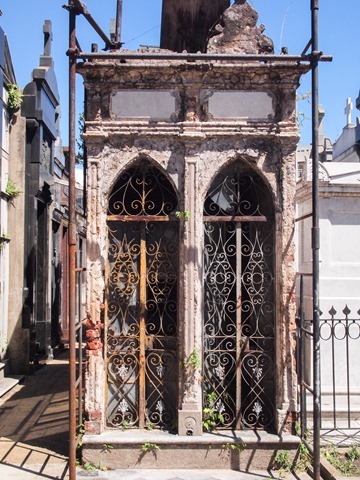 In the last 100 years, Buenos Aires’ story has been laced with the dark thread of political conflict. Grand ideologies gave way to sinister levels of control and politicians were hailed as demi-gods even as thousands of former Nazis were escaping justice and setting up home in Argentina. Buenos Aires is a city that was bombed by its own navy. It’s a city that watched, helpless, as thousands of people vanished, were tortured and murdered under the military junta. Now walking through the vibrant streets, lingering on street corners to chat, one cannot help but be acutely aware that only thirty years ago such liberty seemed impossible. Even now, it’s fair to say the city’s future is not exactly certain. In the week we visited, a Jewish lawyer was found dead of a gunshot wound, just hours before he was due to present evidence against the current government’s role in covering up the 1994 bombing of a Jewish cultural centre. The government claimed it was suicide. 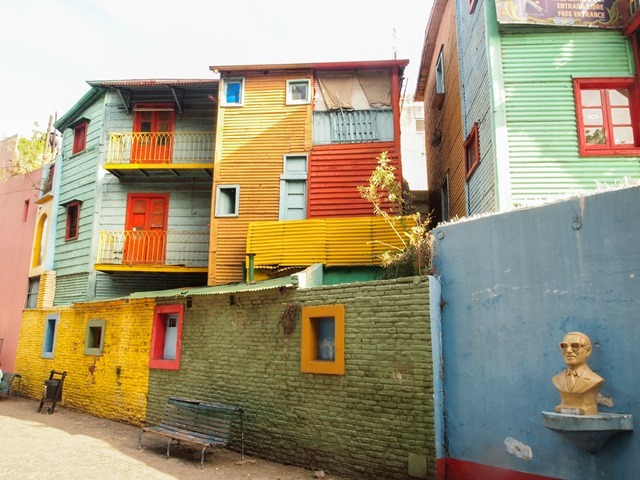 For all its beauty, its culture, its vibrancy and its quality of life, Buenos Aires has a deeply ugly side. And that, for me, is what makes it so much more than just a tourist destination. 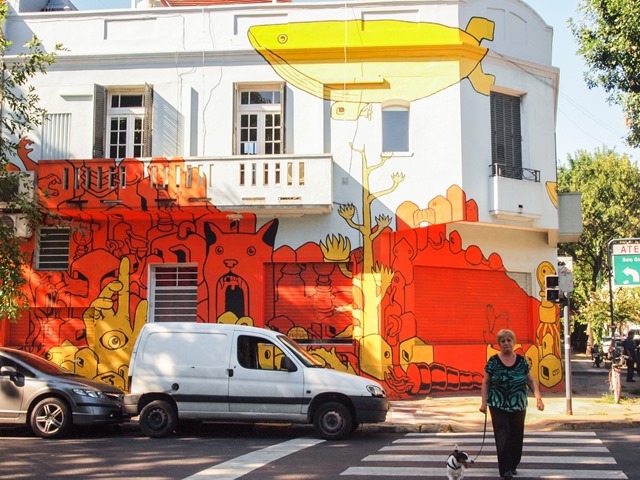 Buenos Aires is not a fantasy. It is real, it is dark, it is complex and after the sight-seeing is done, there’s still so much more to learn, to understand. Try as I might, I can’t shake off the feeling that I have not finished with this city. Whether you have it in a traditional spicy moqueca stew, fried with rice on the beach, stuffed into a bolinho, “by the kilo” in one of Brazils excellent buffet eateries, or served up raw in a sushi bar, Brazil is the place to develop a taste for seafood. Rob went crazy for the late night prawn cupcakes at Belmonte in Rio while Franki loved the moqueca up in Salvador (white fish and prawns stewed in coconut milk and served pretty much everywhere). We tried Sushi at Soho in Salvador and at Azumi in Rio and the latter – thought not cheap – was sensational. A note to vegetarians: It’s not easy to avoid meat in Brazil so if you do find yourself existing on side dishes, you can at least take comfort in the fact that the fruit in Brazil is possibly some of the best I’ve had anywhere in the world. In fact, Franki’s pretty sure she developed a pineapple addiction during our stay. 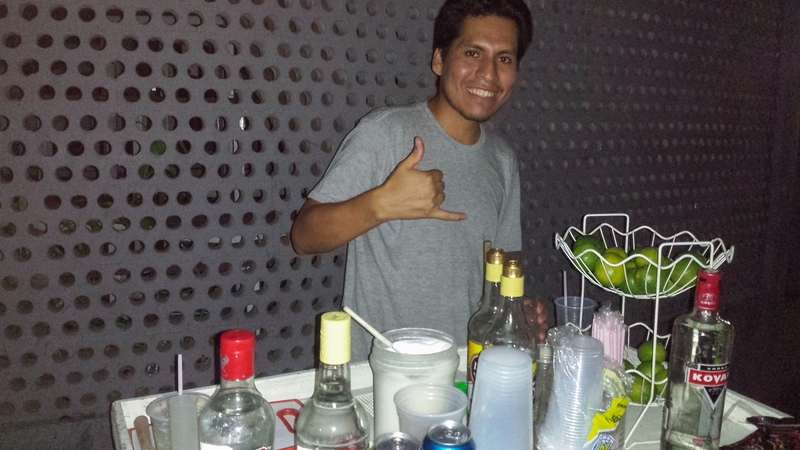 The classic Brazilian cocktail – cachaça, sugar and lime – needs no introduction. Though the hangover you get from consuming that much alcohol alongside that much sugar should probably be mentioned. 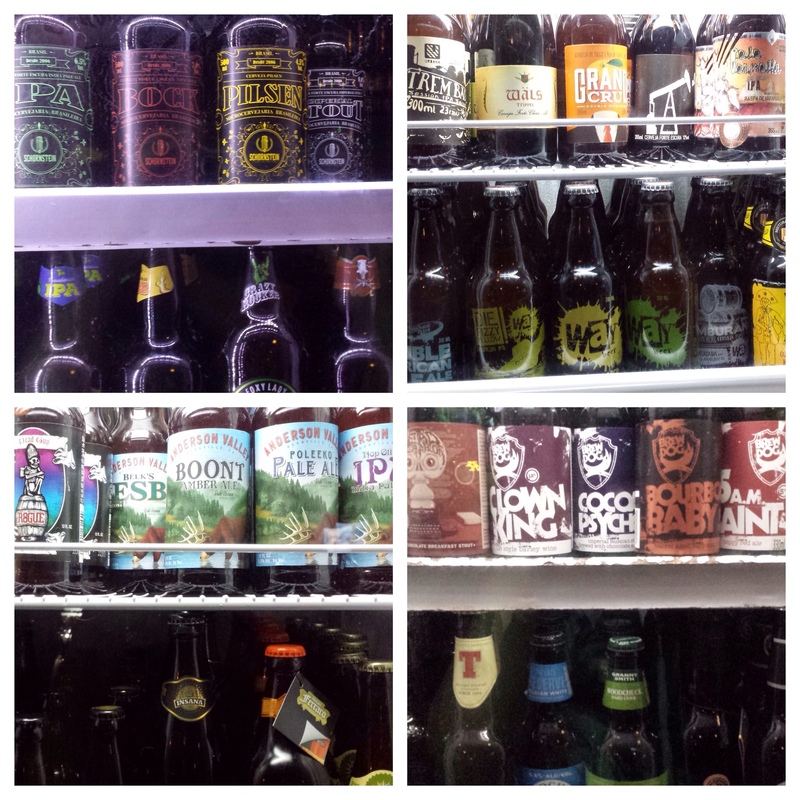 Nevertheless, they’re delicious and astonishingly easy to put away – see the latest Booze of the World for more! Back home it’s been trendy to drink coconut water for quite some time but it’s taken me until I came to Brazil to really appreciate quite how glorious it can be. 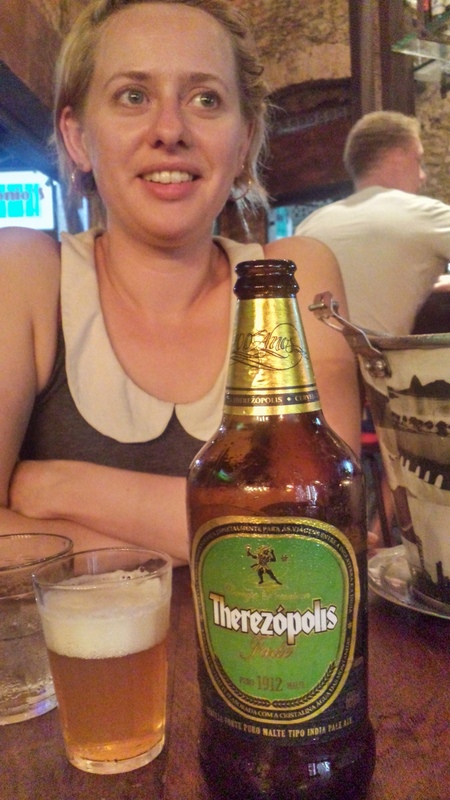 Of course it’s a bit different when you’re drinking it straight from the source. On almost every street corner is a kiosk with a cool box full of fresh coconuts. They hack the top off with a machete and hand you a straw. It’s heaven in the heat. Rob was barely able to walk due to back problems so didn’t have the chance to embarrass himself. 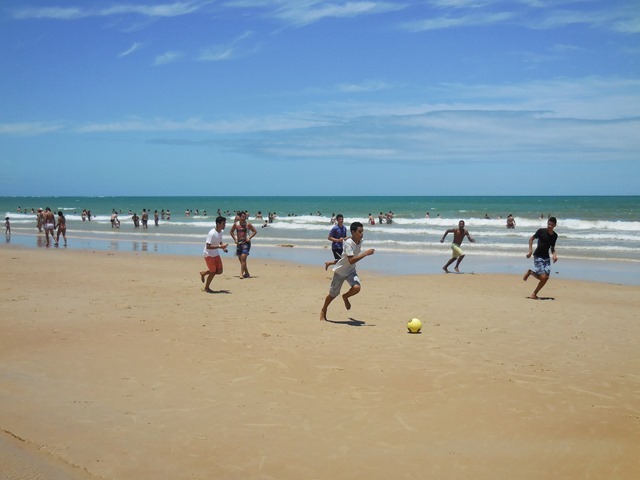 But Brazilians really do play football on the beach and they are damn good too. One kid scored a goal reminiscent of Gazza v Scotland at Euro 96 and barely celebrated. If an Englishman had scored that in the park he’d never pay for a drink the rest of his life. Joga bonito! Possibly Brazil’s greatest fashion export [can’t be bothered to actually research this so let’s go with it!] Havaianas are the footwear uniform for tourists and locals alike. You can find them everywhere, from supermarkets to shoe shops and of course the ubiquitous Havaianas stores in every town. They’re comfy, colourful and best of all, you can pick them up for less than R25 (around £5/$8). At prices like that you can have a different pair for every day of the week! 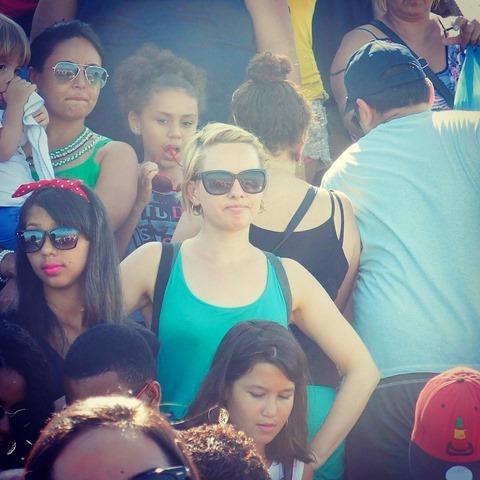 Time for a public service broadcast: Buying bus tickets in Brazil is annoying. You can’t buy them online unless you’re Brazilian (the booking form requires you to enter your Brazilian social security number) so you have to go the bus station. But the buses tend to book up quite quickly so it’s a good idea to plan ahead and get to the bus station ideally three or four days before you intend to travel. If you have plenty of time this won’t be a problem. If you’re on a tight schedule [check!] and/or you’re travelling during public holidays [check!] you may well find yourself wanting to scream. He might represent heaven but we can honestly say we found the trip to get up close and personal with one of the world’s most famous statues to be hellish on all fronts. Even without the four hour queue, the heat, or the absolute joke that is the ticket-purchasing system, you’re still talking about a lot of effort simply to stand in front of a statue you’ve seen a billion pictures of and can be admired from one of the many rooftop bars around the city. And once you get up there… oh my gosh. As Rob put it, “Now, admittedly I’m Jewish but I think you would struggle to find less Christian behaviour than I saw up at Corcovado.” Now, prone as he is to acerbic overstatement, he has a point. Everywhere you look is selfishness and narcissism as people literally shove you out of the way, elbowing each other in the ribs to get a selfie with the art deco icon. 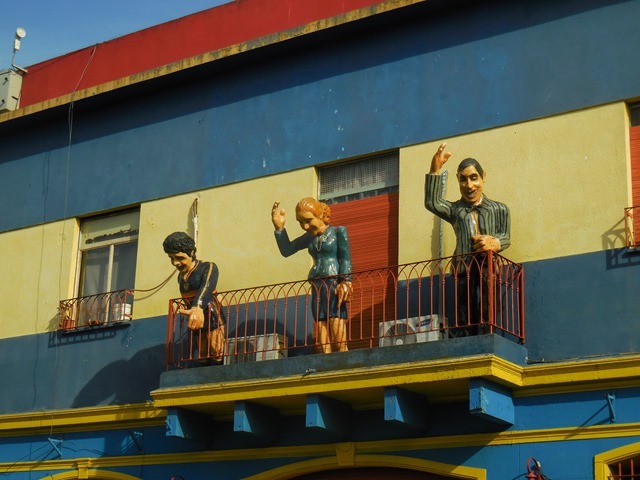 The time we stayed in a Brazilian love motel. These by-the-hour motels gained publicity during the World Cup and led to soaring demand and the opening of higher end luxury versions. And it turns out they’re pretty good value! You don’t have to rent them by the hour and rooms start at R165 a night (£35/$55) which in Sao Paulo was actually cheaper than some of the double rooms in hostels. Plus how often do you get to stay in a hotel room with a glitter ball? 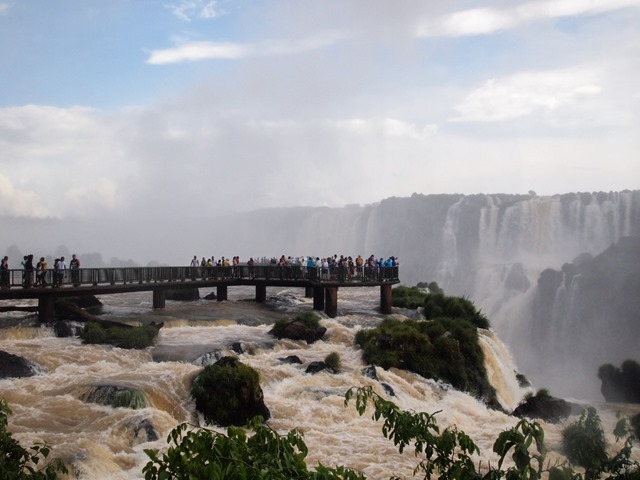 Visiting the Iguaçu Falls from the Brazilian side is more or less foolproof. Just turn up, go see the Cataratas, and then get the hell out of there. It’s so easy it barely even warrants a blog post but we needed an excuse to show you some of our pictures. 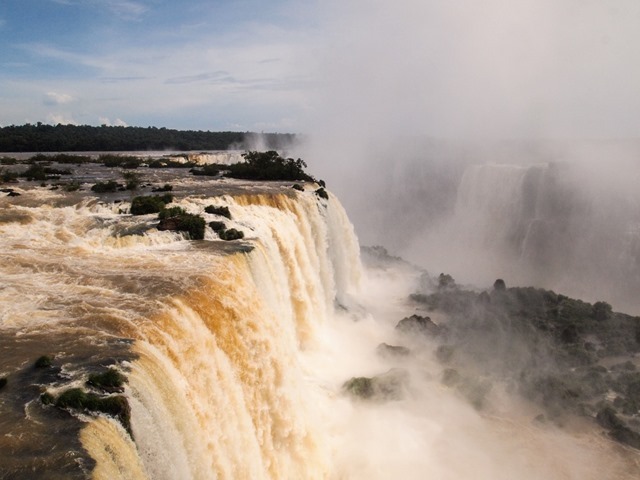 So here are our three “Top Tips” for visiting Foz de Iguaçu. If you’re staying in Foz, you need two days, max. 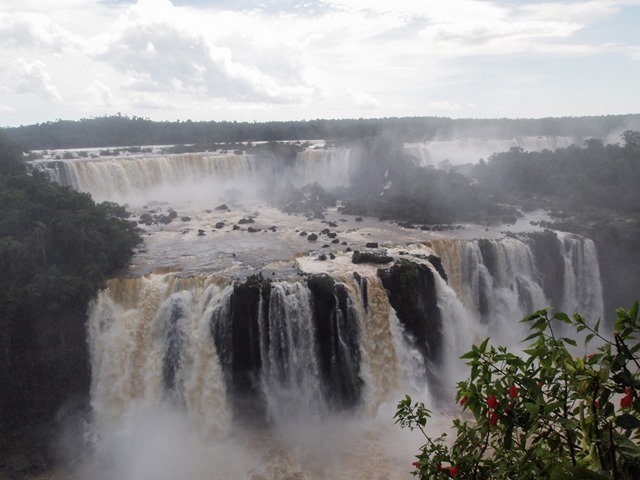 Do the Brazil side in a couple of hours then book a day trip to the Argentinian side (you can visit independently but to be honest it’s worth the money just to avoid the palaver at the border). Foz itself is entirely without touristic appeal. There isn’t even a good restaurant to take the edge off its relentless charmlessness. Get in and get out. You WILL get wet. 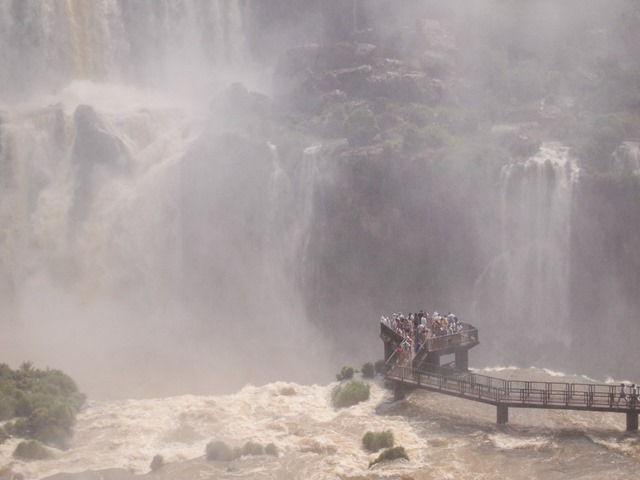 Not only from the spray coming off the falls but if it rains (which it does, a lot) you will get soaked to the skin. We got caught in not one but two serious storms and it really wasn’t much fun. Also, do make sure your electricals are safely stowed in waterproof bags or at least a plastic bag inside your backpack or handbag. 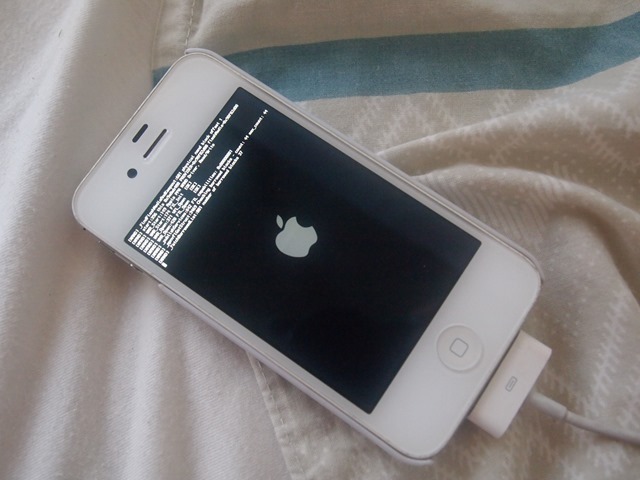 If you need further convincing, this is what happened to Franki’s iPhone after a very soggy trip to Garganta del Diablo. 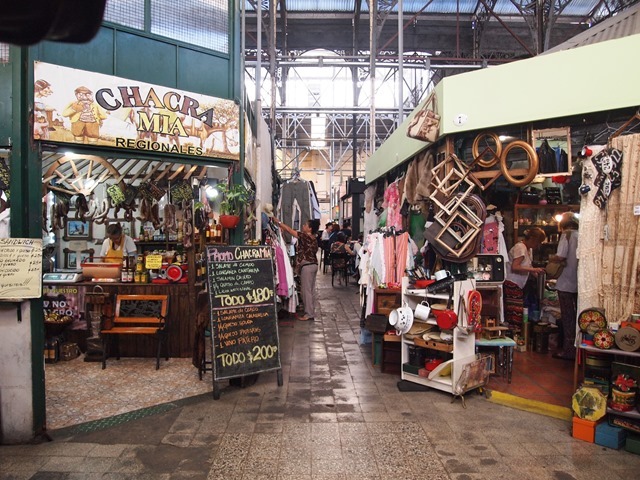 Ciudad del Este, over the border in Paraguay, is a tax-free shopping haven. If you do have an extra day or you’re looking to replace lost or broken electricals, this is the place to go. It’s hot, dirty and hideous but worth it for the cheap deals. On our last day we took a bus to the Free City Of The East, as we dubbed it, and picked up a new backpack for Rob and a new smartphone for Franki (see above). 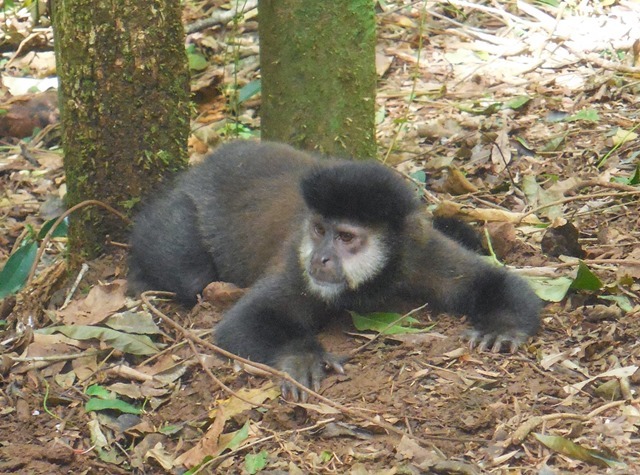 … and one of a monkey. 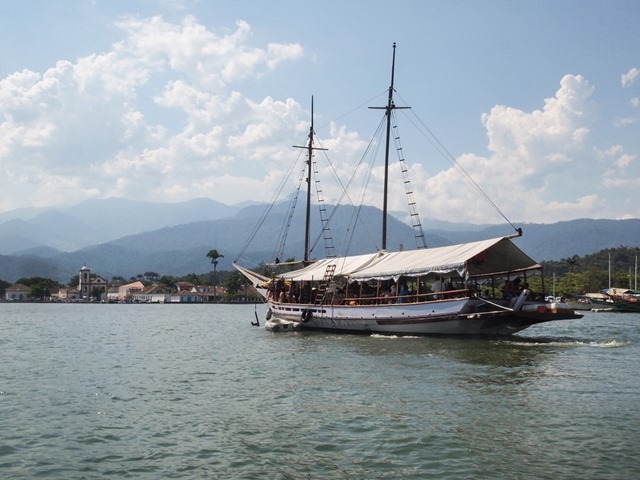 We arrived in Paraty on January 10th. I wouldn’t recommend it. To be honest I wouldn’t recommend going anywhere in Brazil in January. After a beautiful Christmas and New Year in Trancoso and Salvador, we made our way back to Rio for a few days. And that’s where it started. Over the course of the week, the mercury crept up. We took needless trips on the metro simply to be somewhere air-conditioned. By the time we left the city, the temperature had hit 40 degrees and the humidity was closing in. Our escape to the countryside did nothing to relieve us. Even the most beautiful places on earth can be rendered ugly when merely venturing outside your hotel feels like being suffocated with a warm, damp flannel. 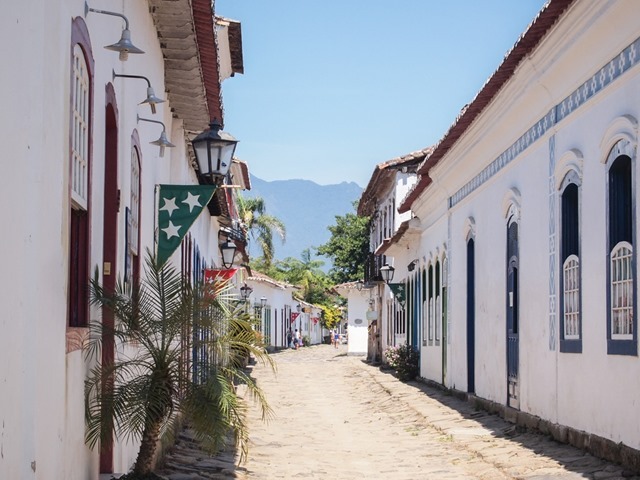 Paraty (pronounced Para-chee) is a tiny colonial town, four hours down the coast from Rio de Janeiro. 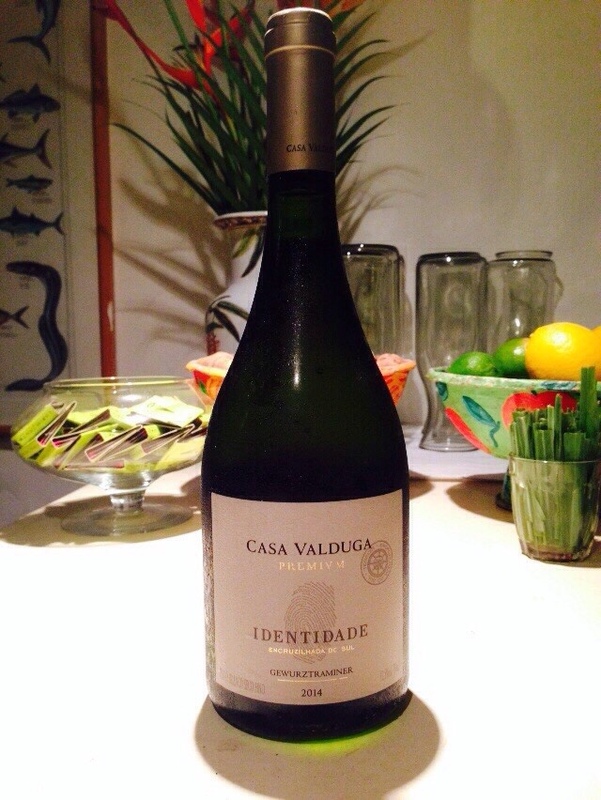 It was built in the mid 1500s by Portuguese gold prospectors. They found what they were looking for and set up shop right here between the mountains, the rainforest and the ocean. 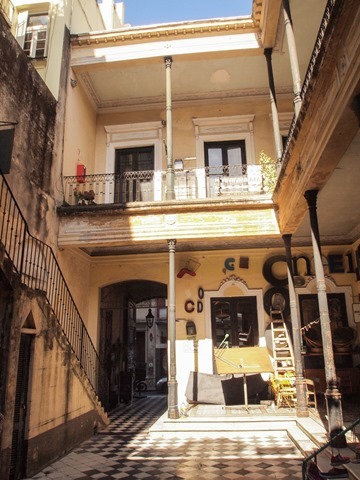 Like Cartagena and Salvador, the city centre is a UNESCO World Heritage site and as a result a wander through it’s cobbled streets feels rather like stepping back in time. Given the extreme heat, it quickly became clear that our time-travel experience would be more enjoyable under the relative cool of evening. By which I mean 37 degrees as opposed to 40. I had to buy two pairs of shorts (and I do not do shorts) but by that stage I’d have happily walked around in my underwear. Oh wait… this is Brazil, I can walk around in my underwear. Well, my bikini anyway. 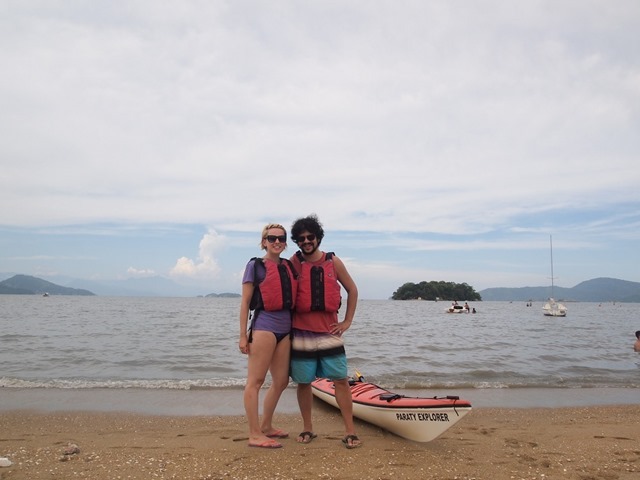 And luckily there are plenty of activities in and around Paraty for which swimwear is the only appropriate outfit. First on anyone’s list should be a boat trip around the spectacular bay. They’re easy enough to find. Just head down to the marina and pick one. We walked past dozens of gorgeous boats, decked out with tropical printed cushions and brightly coloured bunting, until we found the “Moana”. For R50 (£12.50) we were able to take in four different swim stops, including the much-vaunted turtle beach where a colony of sea turtles can occasionally be spotted in the warm, green water. And when I say “warm”, please know that this isn’t just a case of trite travel copy. As the sun beats down, anyone looking longingly at the glistening waves is in for a surprise. Jumping off the boat is like jumping into a bath as the shallow waters around the islands retain the day’s heat. Still, the breeze is beautiful and the views… yeah, the views were alright. Inland we had more luck cooling off. 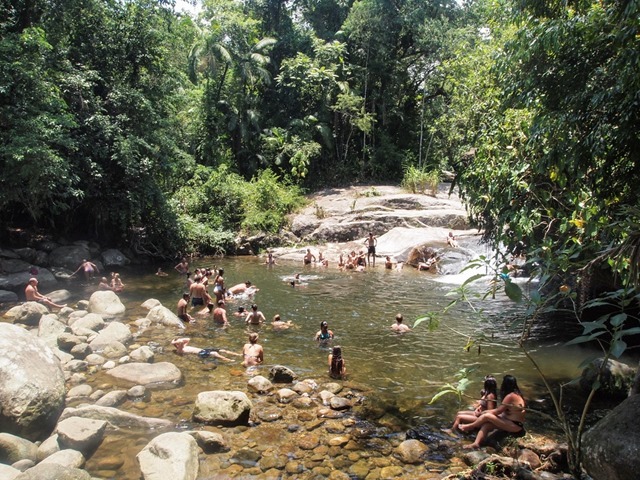 At Cachoeira do Tobogã you can slide down the natural waterslides created as the river water flows over smooth rocks. Sit at the top and one of the locals will be kind enough to give you a push… that’s if they’re not busy showing off. The boys attract quite a crowd as they perform tricks, sliding down on their feet, flipping into somersaults, and landing in perfect dives at the bottom. Fearing the broken bones, we retreat upstream where you can swim in the freshwater pools or lie beneath the waterfalls. This is basically Rob’s idea of heaven and I lost him for some time to the gently cascading waters. From Paraty bus station the bus to Penha costs just R3.40 (85p) and takes half an hour. From Penha it’s a ten minute walk to the waterfalls. Entrance is free and there’s a cafe (read: tourist trap) alongside the pools where you can buy lunch and drinks. 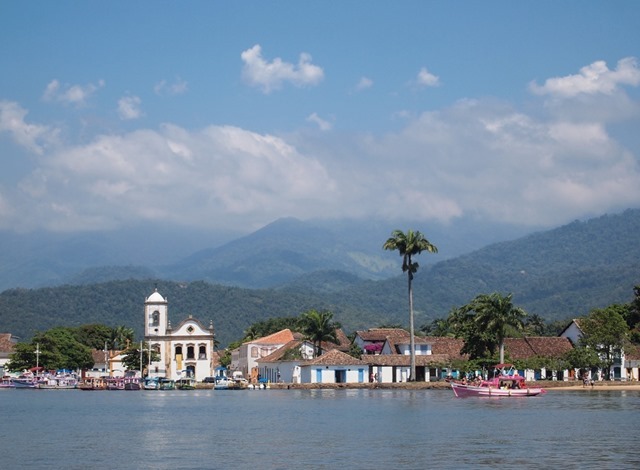 Speaking of food, Paraty has plenty to offer in terms of restaurants. If you can handle the (extra) heat, the pretty courtyard at Thai Brasil on Rua do Comércio is a fantastic place for a fish curry. Our favourite was the slightly pricier Banana da Terra on Rua Doutor Samuel Costa which does classic Brazilian food (get the octopus, it’s delish!). And Rob kindled something of a love affair with Pistache, an ice cream parlour where you pay “by the kilo” although whether or not you eat by the kilo is entirely between you and your coronary arteries. At the start of the week we had enthusiastically booked ourselves in for a four-hour kayaking trip. It sounded idyllic at the time; an early evening paddle out across the bay and through the mangrove swamps to watch the sun set over the mountains. But after a few days in this sweatbox I have to say we were slightly dreading it. I mean, kayaking is exercise for crying out loud. In some kind of divine intervention on behalf of our sweat glands, however, the sky clouded over and as we made our way to the beach there was actually – can it be true? – a light breeze. The day was turning dusky and as we paddled our two-man kayak out towards the islands, we were able to catch the occasional silvery flash of fish leaping out of the water. Well, I did. Rob, as the rear oarsman, couldn’t see a damn thing. 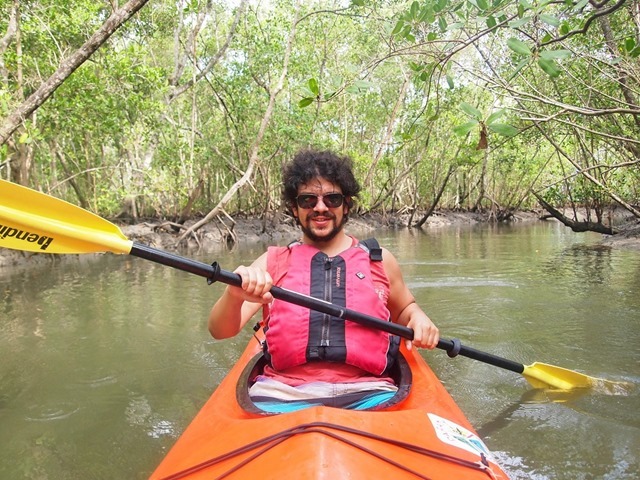 He fared a bit better in the mangrove swamps where enormous vivid red crabs scuttled about on the muddy banks and across the low branches of the trees, often just inches from our faces. On the way back we stopped on an island, bought up a few years back but abandoned after the owner ran out of cash for his building project. 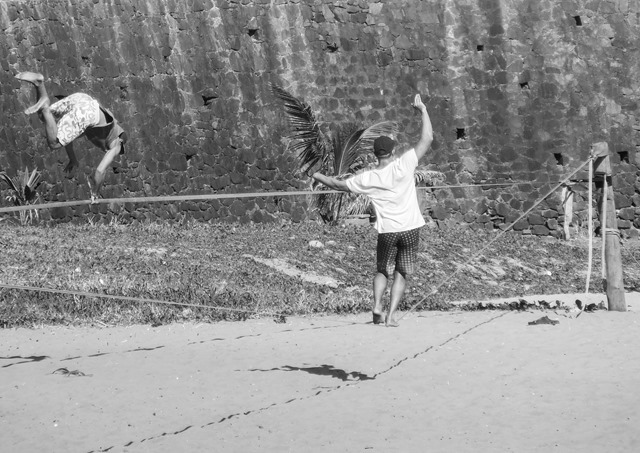 Along with our guide, we ran along the half-finished jetty to the palm-lined pathways where we shook coconuts down from the trees and bashed them against the rocks. 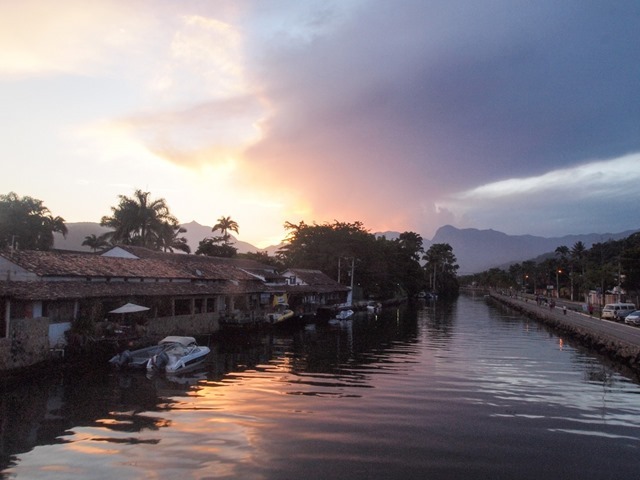 We walked back in the dusky evening light, winding our way through Paraty’s fairytale streets, now alive with light and life. The grand wooden doors leading to shops and restaurants were opened wide and through the latticed windows came the sound of laughter and music. On the way we stopped to take pictures of the sunset. Looking at them you’d never know that all we wanted to do was get back to our air-conditioned hotel room. So long, Paraty. Thanks for a sweaty, sweaty time. It won’t come as earth-shattering news that Rio de Janeiro is pretty awesome. 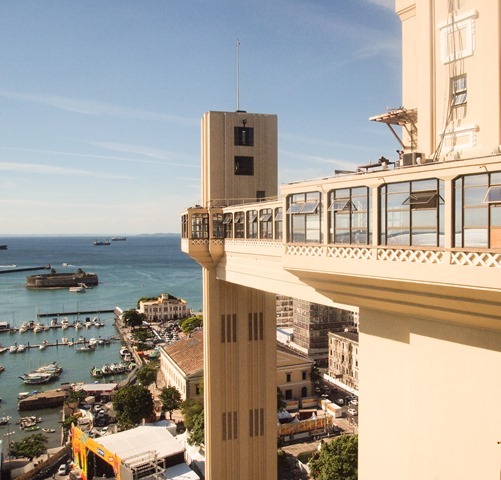 Brazil’s beachside metropolis was already high on the list of must-visit cities before the 2014 World Cup but the football bonanza has made Rio hotter than ever. We’re assuming you already know about Christ the Redeemer, favela tours and Copacabana Beach. So here’s the Let’s Be Adventurers rundown of the best of the rest. 1. 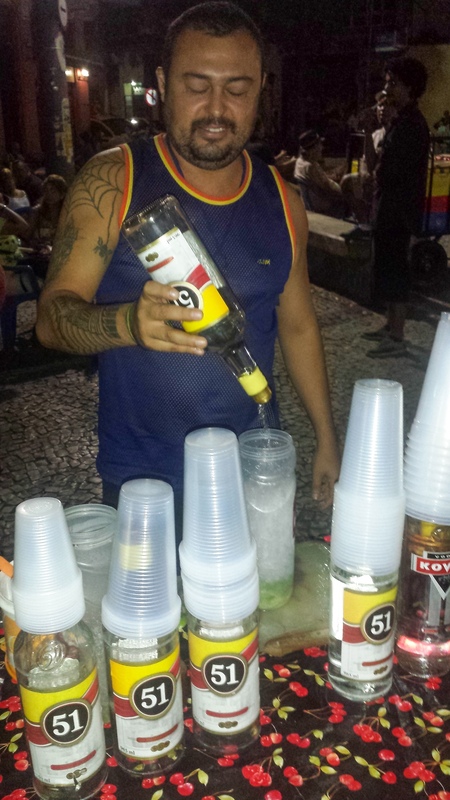 Drink street caipirinhas in Lapa – A lot of tourists end up staying in Copacabana or Ipanema but the truth is that neither are particularly interesting, or authentic, when it comes to nightlife. 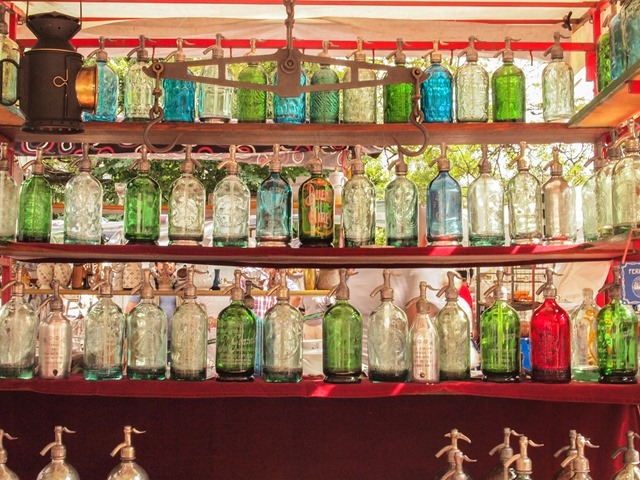 Instead, head to the all-night street party that is Lapa, where Rio’s cool and multicultural kids hang out, listening to live music, flirting outrageously and drinking caipirinhas sold by street vendors. There are cool bars and restaurants here too but most of the action is outside. 2. Take the Metro – If you visit in Brazil’s sweltering summer, chances are it’s 40 degrees outside, you are a sweaty mess and you need a break. So the air-conditioned Metro comes as a blessed relief. Buy a MetroRio card and ride in ice-cool comfort throughout the city. It’s safe, clean, affordable and a great way to check out attractions further afield, such as the world-famous Maracana stadium. 3. 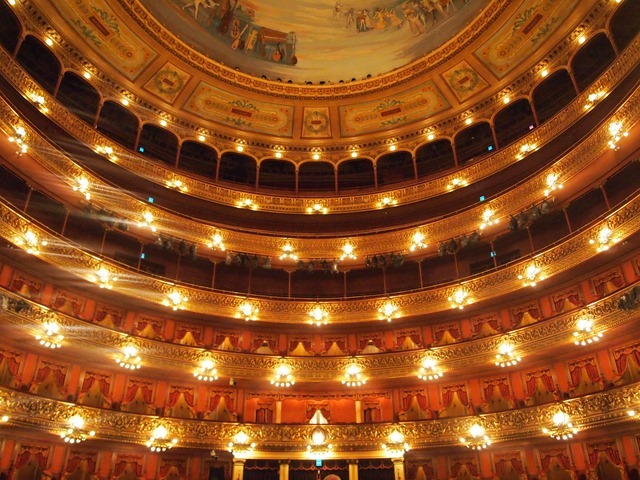 Catch some live music – In Lapa, but also further afield, Rio has some great live music. If you’ve spent any time in the rest of Latin America before arriving here, you’ll be sick to the back teeth by now of salsa, cumbia, and Latin love songs by some middle-aged sap moaning about his bloody ‘ corazon’. 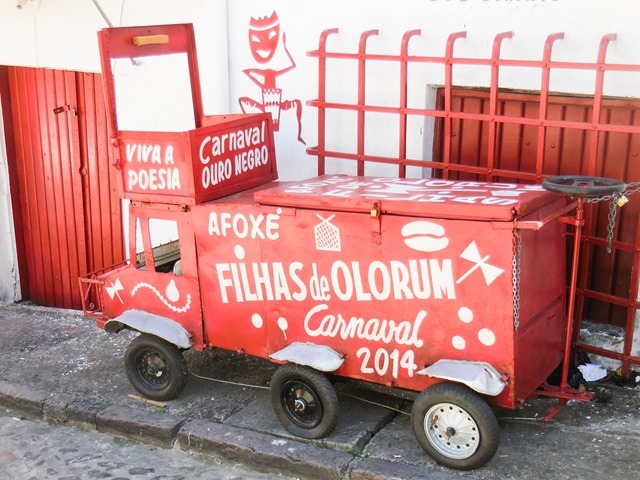 With its diverse cultural influences, Rio has a more eclectic scene with anything from funk, jazz, rock to tourist-friendly samba all to be found all over town. 4. 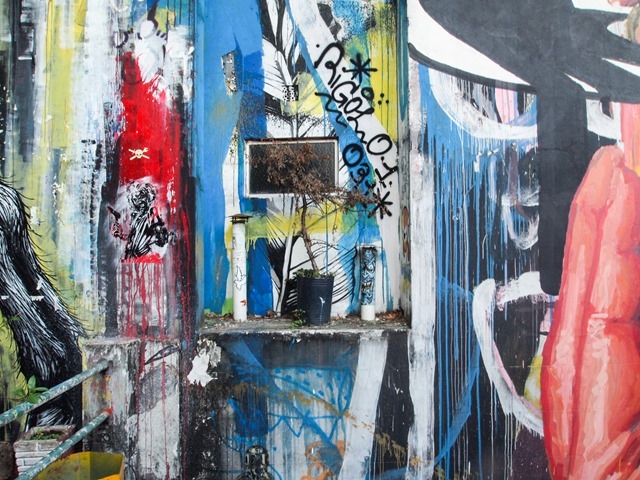 Stroll around Santa Teresa and the Selaron steps – Just up the hill from Lapa is the artsy and chilled Santa Teresa district, a tranquil spot for a relaxed wander through winding hillside streets, glimpsing views of the city through the gaps between some of Rio’s most attractive houses. 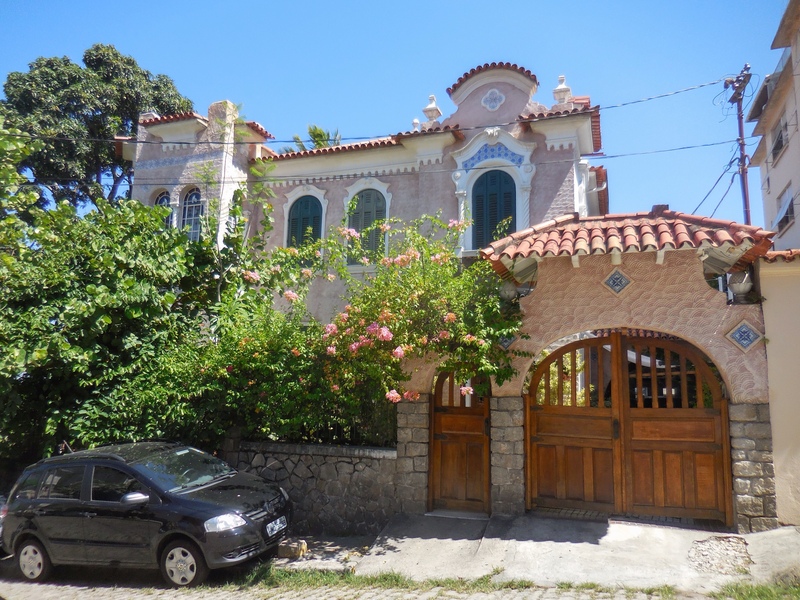 From Santa Teresa, walk down the hill to the top of the Escadaria Selaron. 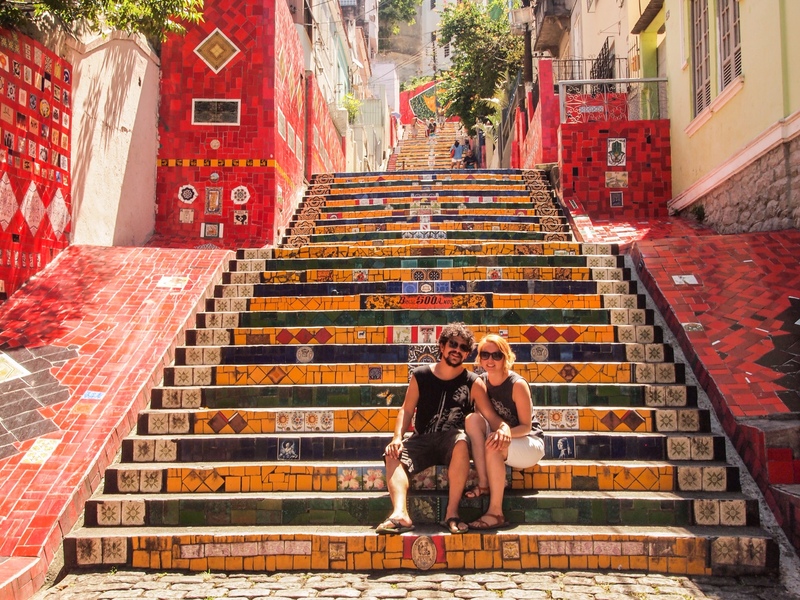 These colourfully tiled steps were a gift to the city by Chilean-born artist Jorge Selaron who lived here either side of the millennium , this is an amazing public artwork that you could spend ages exploring. As you descend, you’ll see that it was put together using tiles donated from around the world by admirers of his project. 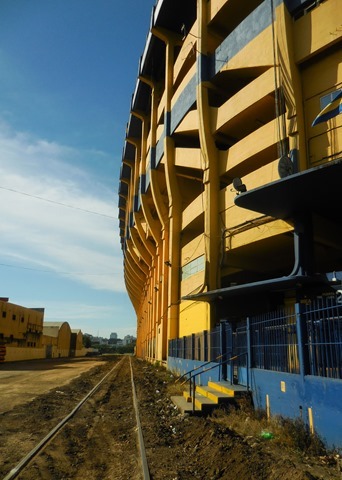 Selaron was found dead on these very steps in 2013, an end befitting Brazil’s potent mix of passion and tragedy. 5. Eat prawn cupcakes – Alright, they’re not really called prawn cupcakes. 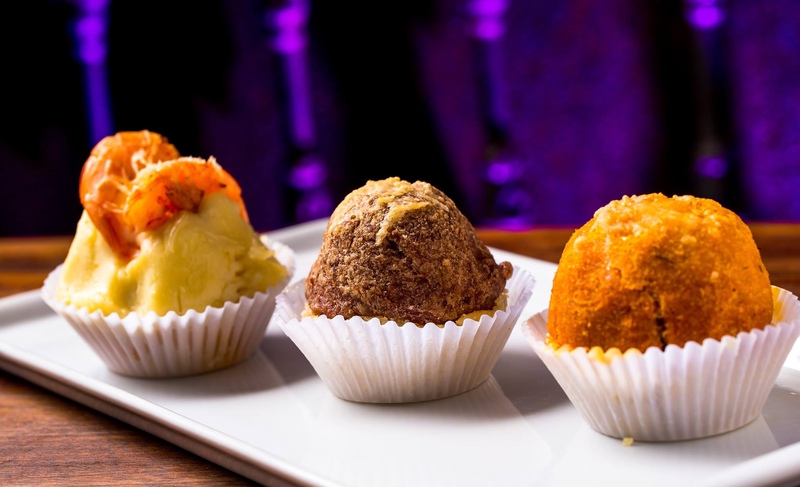 But if you go out drinking in Rio’s bars, you’ll often see waiters circulate with trays full of delicious-looking snacks, such as bolinhos of cod and little cupcakey things with delicious fillings such as prawn or cheese. Or both. Not only are they tasty as hell but at 2am they’re a great way of keeping a lid on your drunkenness. If that’s what you want. 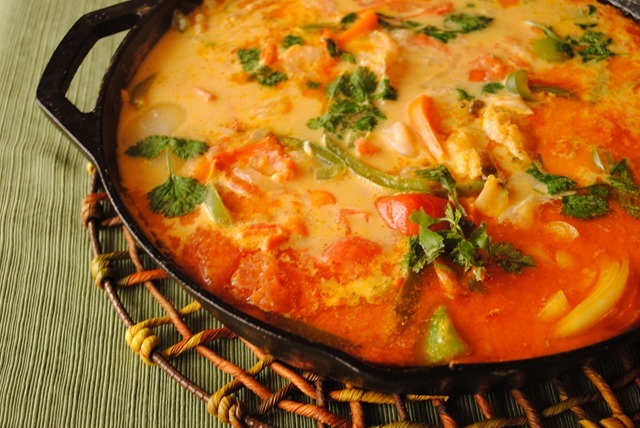 Try Belmonte in Lapa or Copacabana for mouth-watering late-night snackage. 6. Go for sushi – Not immediately obvious perhaps but Rio enjoys the winning combination of a large Japanese community and all the fish you could shake a stick at. At Azumi in Copacabana, we wolfed down some of the most succulent melt-in-the-mouth sushi of our lives. It isn’t cheap if you really intend to fill your belly but my word it’s tasty. 7. 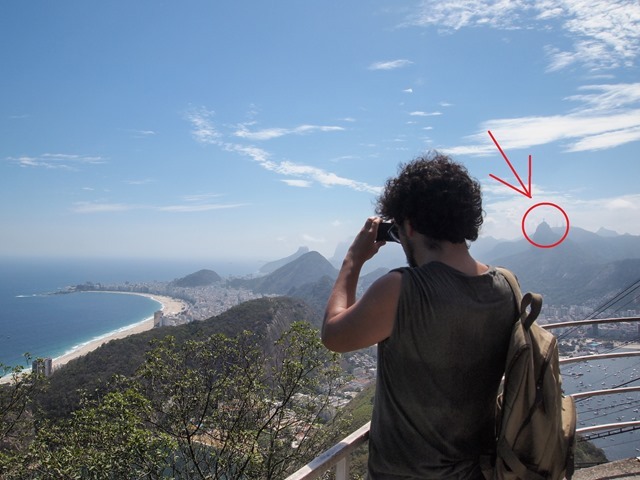 Watch planes take off from Sugar Loaf Mountain – Pao de Acucar, as it’s called in Portuguese, is one of the more obvious spots to visit during your time in Rio. 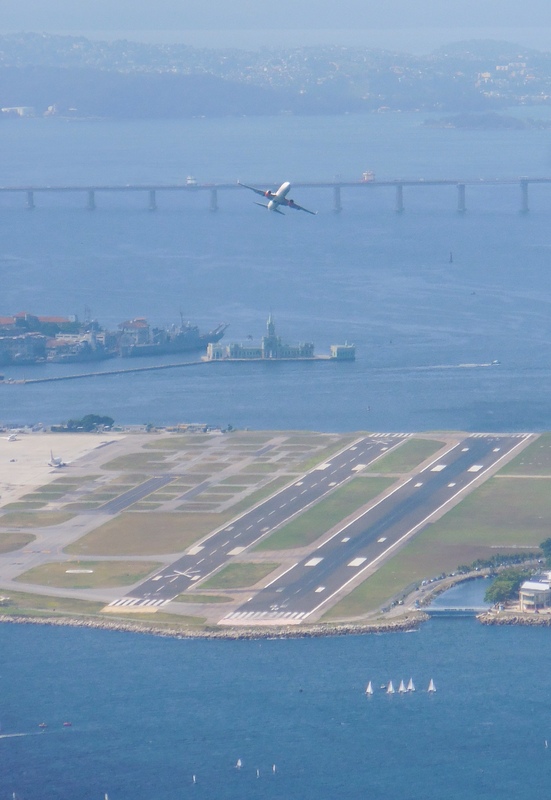 The views of the city are incredible but one of the most mesmerising sights is the aeroplanes taking off and landing at Santos Dumont airport. Watch from above as they speed down the runway – the roar of the engines reaching you a second or two later. As they ascend, they glide past at eye level close enough that you can nearly see the passengers through the windows. Not just for planespotters. Sometimes when you’re travelling you get so obsessed with “doing” that you forget to stop and just “be”. With so many sights to see and limited time, it’s easy to find yourself racing through, packing everything in, ticking it all off. 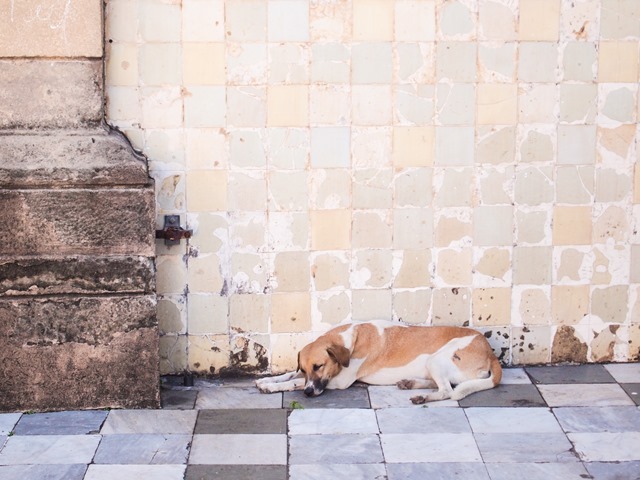 But then you arrive in somewhere like Salvador, Brazil, and you’re forced to stop, breathe, and just take it in. 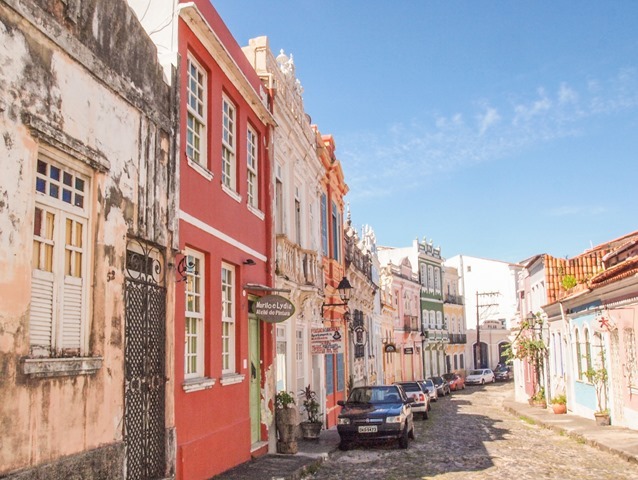 Built on a hill overlooking the ocean, surrounded by spectacular Bahian coastline, and home to some of South America’s oldest colonial buildings, Salvador is undeniably photogenic. But in terms of what there is to do in the city… well, there isn’t much. Salvador is a place you go simply to soak it up. It’s less about doing than about feeling, seeing, tasting, and hearing. Even the locals are known for their relaxed attitude. It might be the party capital of Brazil but here you’re more likely to see people playing music and dancing in the street in their Havaianas than queuing up outside swanky bars and nightclubs. 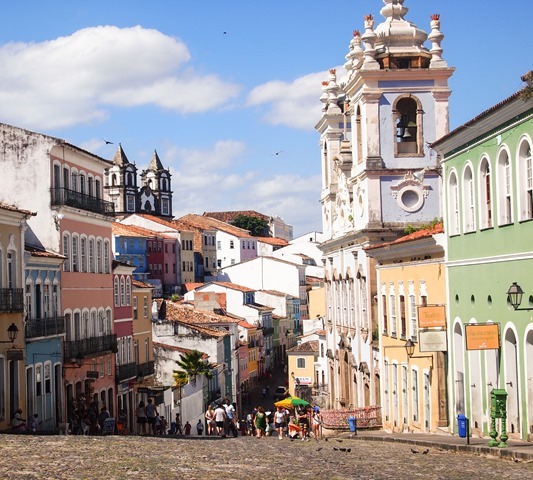 One of the oldest cities in Latin America, Salvador was Brazil’s first capital city, established in 1549. It is Brazil’s third largest city after Sao Paulo and Rio de Janeiro but it suffers from more violent crime than either of them. It is ranked 17th most dangerous city in the world on account of its extreme poverty and gang crime. 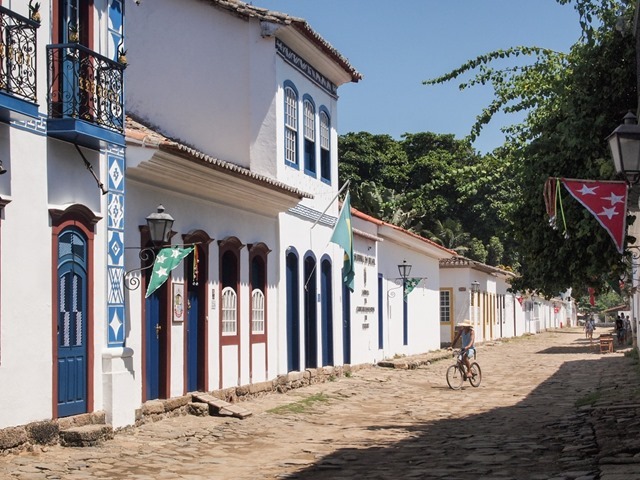 Sitting on a peninsula overlooking Todos os Santos Bay on one side and the Atlantic Ocean on the other it quickly became Brazil’s main port and a hub for the sugar and slave trade. Nowadays it is known as the country’s capital of Afro-Brazilian culture. Of the 2.6 million inhabitants, some 80% have black African ancestry. 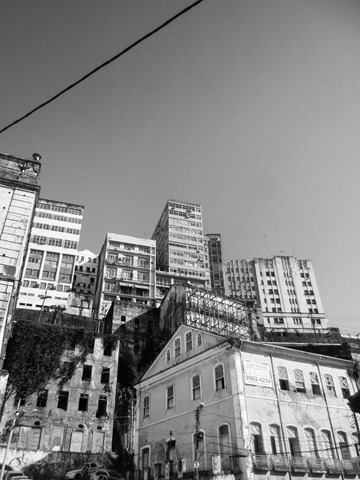 In the stage of Bahia, of which Salvador is the capital, 50% of people live in poverty. The average monthly household income in the city is R1,163 (£255/$390). 12.7% of inhabitants have no income at all. Salvador hosts the biggest annual Carnival in the country and holds the record for biggest party in the world. Construction on a metro system for the city began more than a decade ago. It officially opened in July 2014 but services just five stations, with plans to extend to 15 more. So far it is estimated to have cost more than $1.73bn. 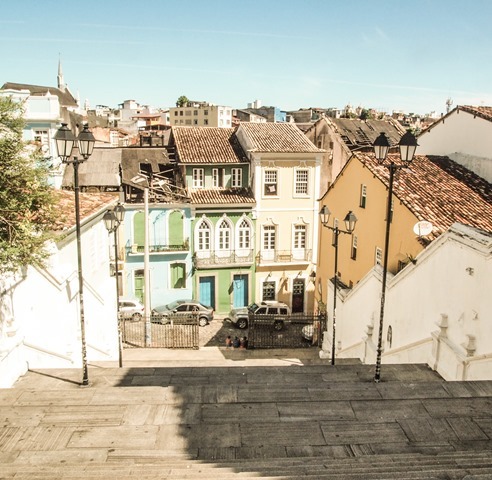 The historic centre of Pelourinho is a UNESCO World Heritage site but it was pretty much a no-go area until 1992 when the local government embarked upon a project called Recovery of Salvador’s Historic Center. The result is that the historic centre is now safe for tourists. The downside is that no locals can afford to live there any more.